Homebuilder confidence held firm for the second straight month this month, according to the National Association of Home Builders. The monthly Housing Market Index registered 16 out of a possible 100. January’s reading is three points higher than the 2010 low-point, set in September, and in-line with last year’s average reading. According to the NAHB, the market for newly-built, single family homes remains relatively weak “following a below-expectations finish in 2010″. Builders expect a better 2011. The Housing Market Index dates to 1985. 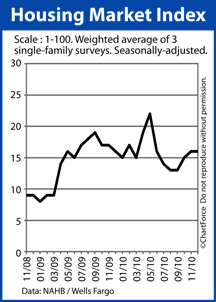 It’s a composite of surveys which gauge the builders’ perceptions of the new home-buying market. How would you rate market conditions for sales of new homes today? How would you rate market conditions for sales of new homes 6 months from now? How would you rate the foot traffic of prospective buyers of new homes? The answers are then collated and weighted, and used to produce the Housing Market Index. In January, market conditions for current and future sales were deemed to be flat. Foot traffic is seen as increasing. For homebuyers of new homes , this data may foretell of more bidding wars in the months ahead. More active buyers means more competition for homes. It may also mean fewer concessions from builders as confidence starts rising. If you’re in the market for a newly-built home, watching the Housing Market Index may be sensible. Each builder is different, of course, but as the overall market sentiment falls, buyers can be more likely to get “a deal”. That’s not the case once confidence is rising. The HMI is plateaued. If it resumes rising later this year, expect new homes to get more costly.